Secreted deep within the Mandarin Oriental hotel is the world’s only Krug Room. Guests are greeted at the Mandarin Grill, and escorted through a maze of corridors to an elegant room that evokes the famed Orient Express train, with views through to the kitchen. Up to 12 guests a night get to embark on a culinary journey created by the hotel’s executive chef Robin Zavou, accompanied by a curated soundtrack and Krug champagne, naturally. 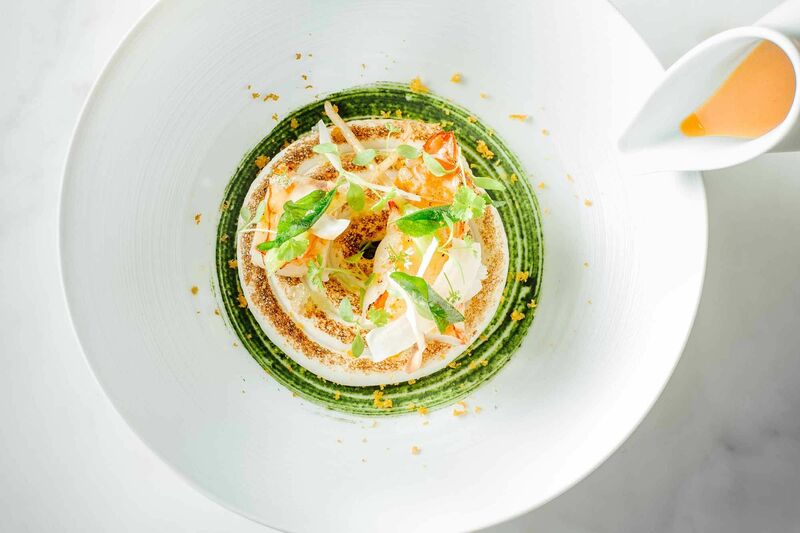 The seasonal tasting menu changes quarterly, but has featured eel doughnut that evokes a salt cod croquette, and red prawn tartare served Thai style with betel leaves. Meat dishes are accomplished, with suckling iberico pig falling apart at the touch of a fork, and wagyu beef so delicious that it doesn’t need an overpowering pickled nori emulsion. Theatre is as much a part of the experience as the food, with well-trained staff adding flourish to the evening. An extensive wine list is available, but why have anything other than Krug? Couples and small groups can book the Krug Room on shared basis Thursdays and Saturdays, while the entire room must be booked on other days.